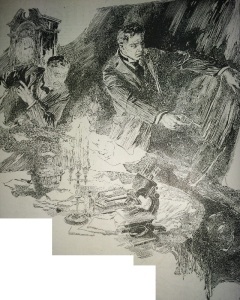 John R. Flanagan provided illustrations for two Sherlock Holmes stories in Collier’s magazine – The Adventure of the Three Garridebs and The Adventure of the Illustrious Client. 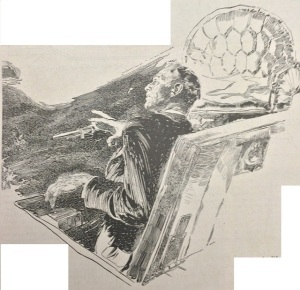 Flanagan’s drawings for 3GAR were also used by Current Opinion when they reprinted that tale in their December 1924 edtion. A great deal has been written about the prinicipal illustrators of the Canon – Sidney Paget and Frederic Dorr Steele – but not much information is known about many of the other illustrators who only did a few stories. John Richard Flanagan was born July 23, 1895 in Sydney, New South Wales, Australia. His father, Patrick Joseph Flanagan, was born in 1871 in Australia of Irish ancestry. His mother, Rose Harvey McCoy, was born in 1873 in Boorowa, New South Wales, Australia of Irish ancestry. His parents married in 1894 and had four children, John (b.1895), Norine (b.1897), Francis (b.1903), and Agnes (b.1904). They lived at 30 Sloan Street, Summerhill, Sidney, Australia. The father worked at the County Jockey Club. The father enjoyed drawing horses, but there were no professional artists in the family. On April 28, 1908 his father, Patrick Joseph Flanagan died at the age of thirty-six in Katoomba, New South Wales. Two months after that tragic death, John Richard Flanagan finished the eighth grade and entered the work force to help support the family. He was thirteen years old. He became an assistant to a lithographer, who produced advertising copy for newspapers. In 1911 he enrolled in evening art classes at St. Joseph’s College, Hunter Hill, where his teacher was Antonio Datillo-Rubbo (1870-1955). In 1913, at the age of eighteen, he served as a Private in the Australian infantry. His service permitted him to remain in Sydney, where he attended evening art classes at the Royal Art Society of New South Wales. 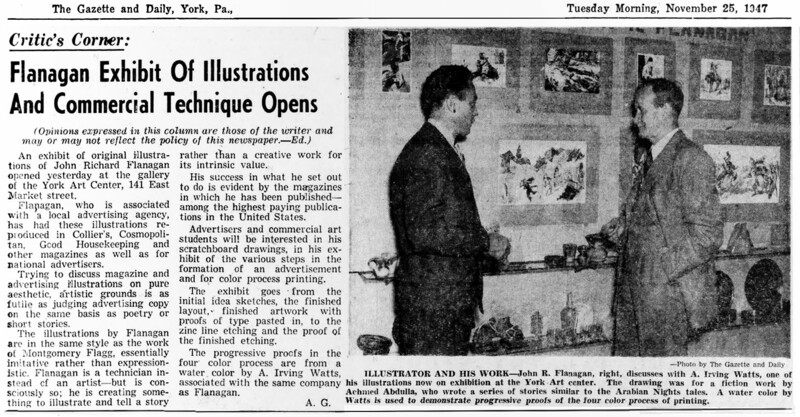 Antonio Dattilo-Rubbo was also an art instructor at that school. He also received helpful criticism from Norman Lindsay (1879-1969). On March 16, 1916 he left Australia and traveled to America on the Steam Ship Makura. He settled in New York City, where he lived at 77 West 12th Street in Greenwich Village. He found work as a newspaper artist. His first assignments were for Everyweek Magazine. 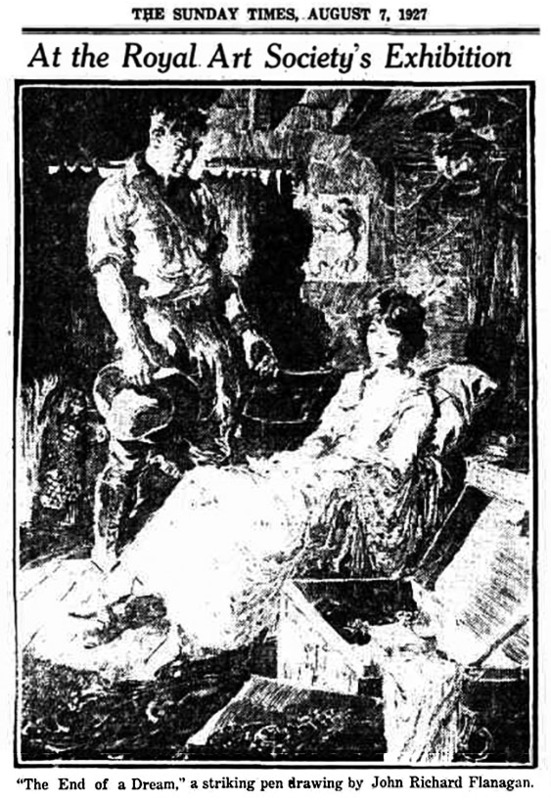 On May 19, 1917 at the age of twenty-two he married Nan Apotheker. She was born February 17, 1895 in NYC of Russian Jewish ancestry. 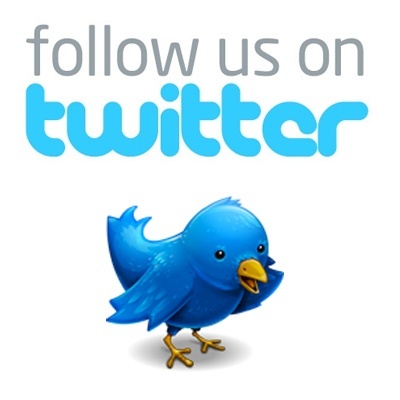 They moved to 565 West 192nd Street in the Washington Heights section of Uppermost Manhattan. On June 5, 1917 he reported for draft registration during the Great War. He was recorded to be twenty-eight, tall, slender, with hazel eyes and brown hair. He listed his three years of service as a Private in the Australian Infantry and requested an exemption because of a “weak heart.” He did not serve in the U.S. Army. 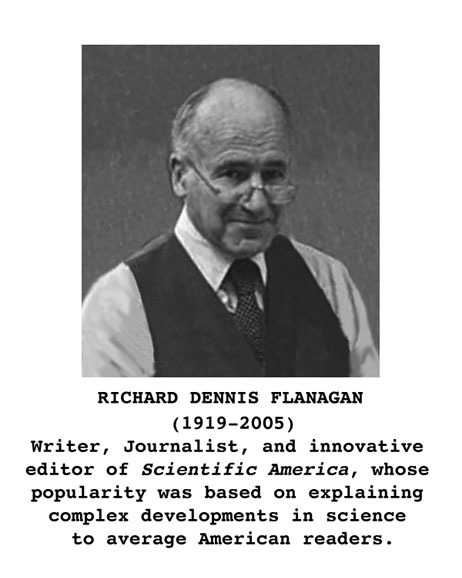 On July 22, 1919 his son, Richard Dennis Flanagan was born. John R. Flanagan rented an art studio in the Arcade Building at 1931 Broadway and West 65th Street on the Upper West Side. In 1921 he illustrated “The Story of the Other Wise Man” by Henry van Dyke for Harper & Brothers. He went on to illustrate popular novels by famous authors, such as Rudyard Kipling, Arthur Canon Doyle, Omar Khayam, Somerset Maugham, and Rex Beach. 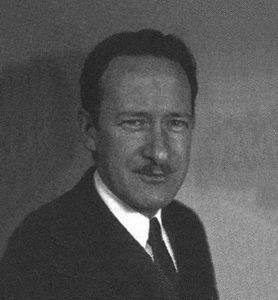 During the 1920s he produced black & white pen-and-ink and scratch-board story illustrations for Cosmopolitan, Pictorial Review, Women’s Home Companion, The American Legion Monthly, Colliers, Liberty, Redbook, and Good Housekeeping. He illustrated “Dr. Fu Manchu” by Sax Rohmer for Collier’s Magazine. He also illustrated “Dr. Yen Sen” and “The Mysterious Wu Fang” for other magazines. During the 1920s he also illustrated magazine advertisements for rugs, radios, and soap. 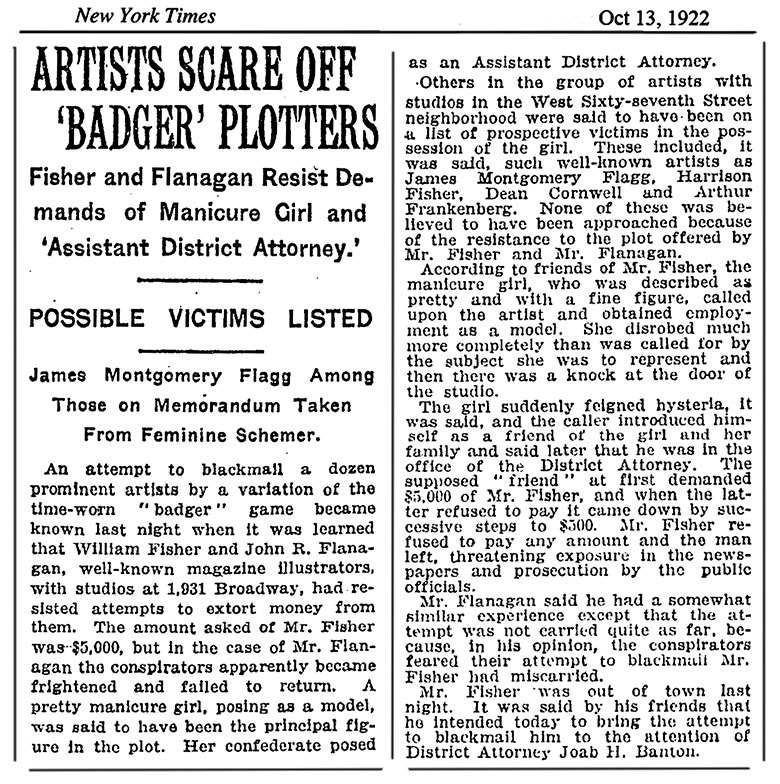 On October 13, 1922 The New York Times reported that John R. Flanagan and William Fisher (1891-1985) had thwarted a team of confidence artists involved in an extortion racket. He visited Far East Asia under assignment to illustrate trade publications of the French Line luxury steam ships. By 1924 he and his wife and son lived at 133 West 79th Street in NYC. In April of 1925 he and his wife and son visited Paris, France. They stayed at the Hotel de Calais on the rue des Cacucines. He returned on the Steam Ship Paris from LeHavre to NYC on May 12, 1925. The marriage ended unhappily in divorce. His son went on to become a successful writer, journalist and magazine editor. 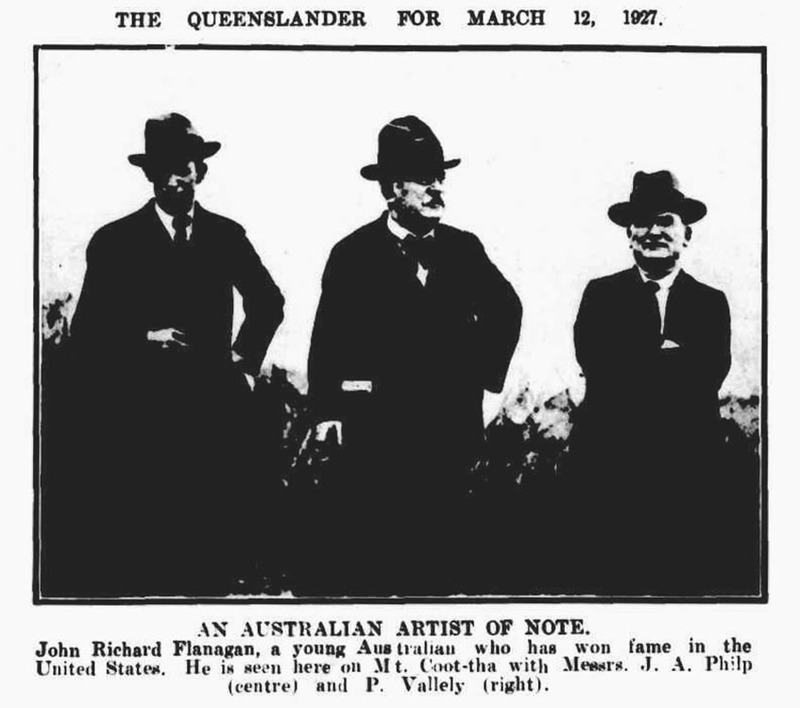 On March 12, 1927 The Queenslander newspaper documented his visit to Mount Coot-tha with James A. Philp, his former editor at The Sydney Bulletin, and Peter Vallely, a popular Queenslander publican. On April 29, 1927 he returned from Australia on the steam ship Tenyo Maru, via Yokohama, Japan, to San Francisco, California, and then through the Panama Canal to New York City. In 1927 he joined to the prestigious Guild of Freelance Artists. On August 7, 1927 The Sunday Times of Sydney featured his work in coverage of the annual exhibition of the Royal Art Society. In June of 1929 he married his second wife, Frances Flanagan. She was born in 1911 in French Canada of French ancestry. She was nineteen and he was thirty-four. In 1930 he and his wife moved to l’Hotel des Artistes at 1 West 67th Street. Other artists with studios in the building at that same time were Norman Rockwell, Howard Chandler Christy (1873-1952), Harrison Fisher (1875-1934), and C. Warde Traver. The Great Depression brought hard times to America workers as well as American industries, which devastated the advertising and publishing business. 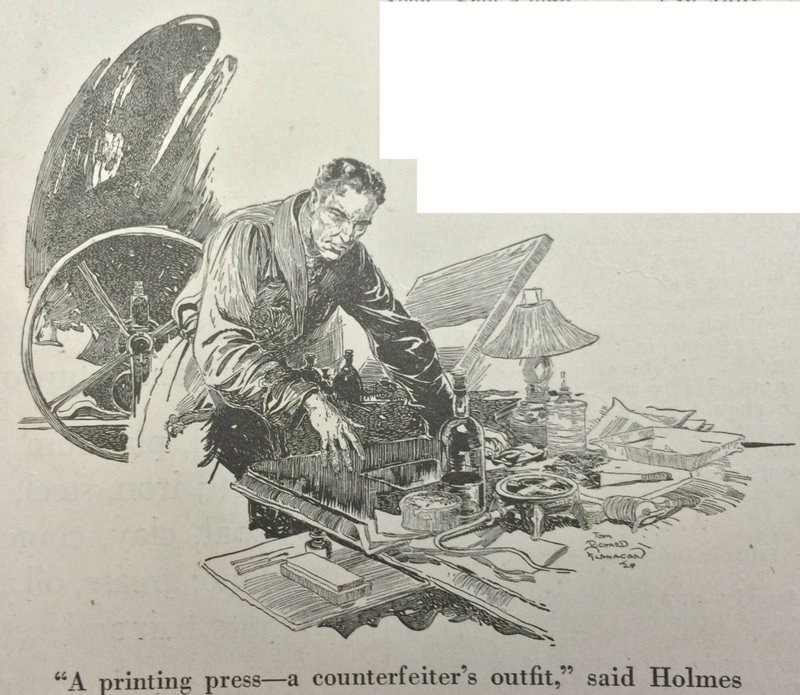 Many established artists, such as Delos Palmer, Walter De Maris, Gayle Porter Hoskins, Charles LaSalle, and Edgar Franklin Wittmack, were forced to work for lower paying pulp magazines. John Richard Flanagan began to work for the pulp magazines Adventure and The Blue Book. He also contributed drawings to the popular humor magazine, Ballyhoo, produced by Dell Publishing Company. In 1934 his second marriage ended unhappily in divorce. They had no children. In 1935 he lived at 20 West 68th Street, which was a popular neighborhood for pulp artist studios. His neighbors included Norman Saunders, Rafael DeSoto, Allen Anderson, George Gross, and Richard Lillis. In 1939 he began to draw for the growing comic book industry. He drew covers for Adventure Comics and Double Action Comics published by D.C. Comics. In 1940 he lived at 99 West Third Street in Greenwich Village. On April 25, 1942 he reported for draft registration during WWII. He was recorded to be forty-six, five-ten, 145 pounds, with hazel eyes and gray hair. On August 23, 1945 he was granted U.S. naturalized alien citizenship. In August of 1947 he left NYC and moved to York, Pennsylvania, where he joined the staff of the W. H. Long advertising agency. In 1957 his mother, Rose Harvey McCoy Flanagan, died at the age of eighty-four in Parramatta, New South Wales, Australia. 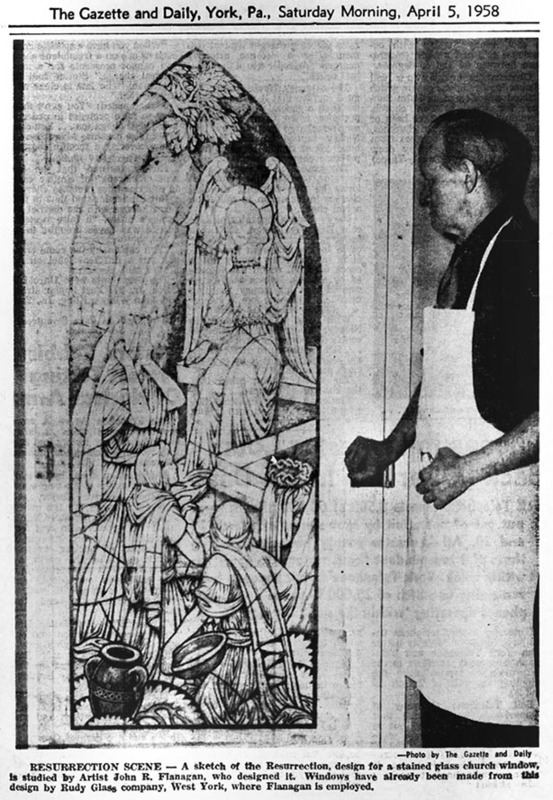 On April 5, 1958 The Gazette and Daily newspaper of York, PA, published an article about his having designed a stained glass window for a local church. He also supervised the fabrication of the project by the Rudy Glass Company of West York, PA.
John Richard Flanagan died at the age of sixty-nine in York, PA, on December 12, 1964. 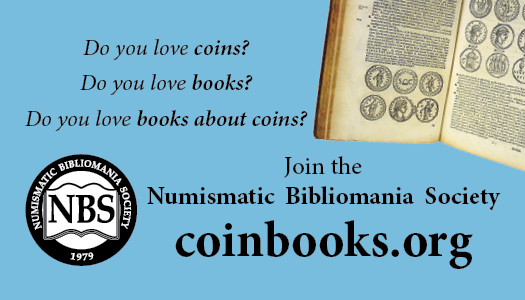 There is a very active Sherlockian scion in the York, Pennsylvania area – the White Rose Irregulars – and several of their members are also members of our group as well. Perhaps someone could do additional research on Flangan’s work in that area? Thanks to David Saunders for graciously allowing us to reprint his post on John R. Flanagan. 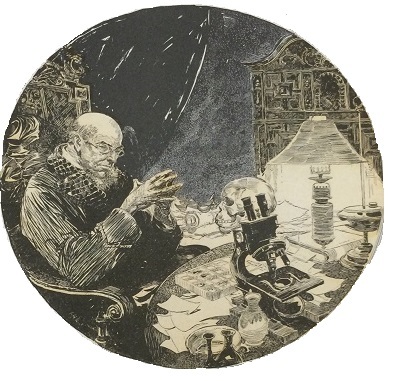 Be sure to check it out to see illustrations of some of Flanagan’s other works.